The West Bend Grotto in Iowa is a place that is not only stunningly impressive and gorgeous in a physical manner, but also an overwhelmingly spiritual experience. A visit to the shine and its connected church is an experience many won’t soon forget. The Grotto was built in the early 1900s by a man named Father Paul Matthias Dobberstein. Built as a shrine to the Virgin Mary after he prayed to be healed from pneumonia and recovered, Father Dobberstein collected various rocks and stones for over a decade before making good on his promise to the Virgin Mary and his subsequent ordination into the Catholic Church. This impressive structure was built by only two men, Father Dobberstein and Matt Szerensce, and it took over 50 years to complete. The grotto has one of the largest collections of precious stones in the area - featuring topaz, malachite, jasper and quartz among others that Father Dobberstein lovingly handpicked. 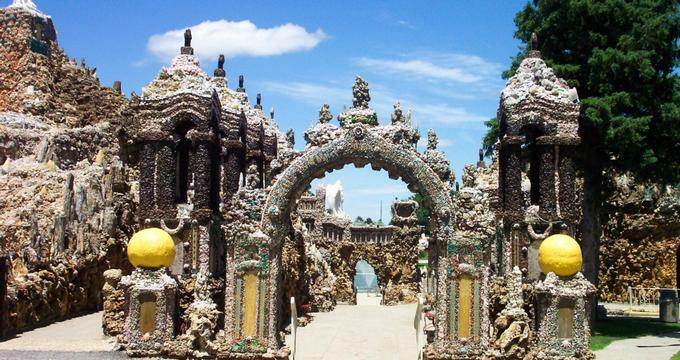 The Grotto is the biggest of its kind anywhere in the world and, especially due to its location in the farmlands of Iowa, is a definitely something any religious visitor should not pass up. Visiting the Grotto is often a religious pilgrimage, as the only attraction is the Grotto shrine and church itself. However, there are many features to notice while you are touring the grotto. St. Michael the Archangel - This statue is an important symbol in the Grotto, representing in physical form the triumph of good over evil, as St. Michael is literally crushing the devil under his foot. The Garden of Eden - Also known as “Paradise Lost,” this scene depicts when Adam and Eve were thrown out of the Garden of Eden after being tricked by the devil (in the form of a snake). The Ten Commandments - Featuring Moses standing on the mountaintop with the Ten Commandments in his hands, this grotto is also known for the many stalactites and rosettes surrounding the statue. The Stable in Bethlehem - Made of over 65 tons (130,000 pounds!) of petrified wood brought in from Montana, North Dakota and South Dakota, this grotto showcases the traditional manger scene after the baby Jesus was born to Mary and Joseph. Christ’s Sermon on the Mount - Showcasing Jesus speaking about the Eight Beatitudes (which explains how to get into heaven), the statue itself is dwarfed by the immense stalagmite (over 2000 pounds) that is originally from Carlsbad Caverns in New Mexico before it was named a National Park. The Christmas Chapel - Located inside the Saints Peter and Paul Catholic church and featuring a 300 pound Brazilian amethyst, this grotto features many of the specimens that are too delicate for the outside elements. The Entombment of Jesus - After being taken down from the cross, the statue commemorating the entombment of Jesus is a beautifully crafted piece of art made out of a single piece of Italian white marble. Statue of Father Dobberstein - This statue was put up in 1992 to honor the 80th anniversary of the start of construction. While the West Bend Grotto doesn’t offer many special events, something that is special to this attraction is the ability for religious visitors to attend for a special pilgrimage. A pilgrimage to West Bend Grotto includes Catholic mass at Saints Peter and Paul Church, as well as receiving the Sacrament of Reconciliation (penance) and having time for quiet, individual reflection in one of the nine grottos of your choice. There is no limit on the time spent in the shrine, and many visitors come and stay from just a few hours to a few days. Those that choose to stay more than a few hours can find lodging at one of the over 50 campsites for a small fee - either in a camper or in a tent. Electrical hookups are available on site, as well as showers and a central water/sewer dump station. Occasionally, special events are offered. Visitors should keep an eye on the website for additional information. The West Bend Grotto does feature a small gift shop, with t-shirts, onesies for babies, small rosaries, crucifixes, statues of iconic Catholic saints and other small gifts. It is open regular business hours, from 9am - 5p except for being closed on Sundays to attend church and spend time with family.